Choose from our Lynn Cove hardware collection of L-Hinges, Strap Hinges, Pintles, Holdbacks/Dogs, Shutter Pulls and Shutter Bolts/Locks. Our cast aluminum products and window shutter hardware are ideal for applications in highly corrosive environments such as coastal areas. Our hand forged steel window shutter hardware are passivated using a ten-step process prior to the application of a protective powder coat. For stainless steel products, Lynn Cove hardware uses surgical grade 304 series stainless steel. Although lower quality stainless steel is more common, this alloy has been specifically selected due to its superior strength and corrosion resistance. Passivation is performed prior to powder coating for extra protection. 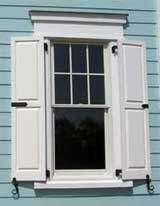 Lynn Cove Hardware is a truly affordable quality collection of window shutter hardware! The Suffolk hinges and pintles are our heavy duty offering, with 1/2" barrels and pins; most competing hinges offer 1/4" to 3/8" barrels and pins. Here is a picture to explain how "Offset and Reveal" affects your hinge choice.